The Villa Medici di Lilliano is one of my favorite locations for a destination wedding near Florence. 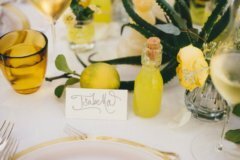 The picturesque garden settings of this venue and terrace with its spectacular view of the city of Florence makes it a unique spot to hold a sophisticated wedding in Tuscany; just 20 minutes away from the city and it’s attractions. The pre-wedding shoot of this lovely couple took place at the Villa, that for centuries has welcomed visitors from different parts of the world to relax and celebrate love and life in Italy, a place of tranquility and stunning views. Note! 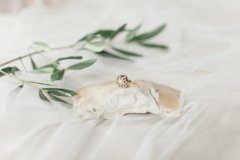 Villa Medici is an ideal spot for an elopement wedding or a proposal too and now you can officially tie the knot on the premises of the villa – a civil one! The sophisticated bride-to-be wore a two piece blush pre-wedding party gown that was tailored for the occasion and paired perfectly with a spectacular hand crafted bridal hair vine by Sibo Designs. 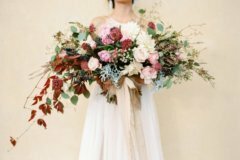 Soft Tuscan Spring colors are the main inspiration for this pre-wedding theme: rose quartz pastel tones, light hues of pinks, muted greys pairing so well with centuries old terracotta of the venue and the olive groves. We combined dark grey chargers with antique porcelain white plates, crystal glasses, silver cutlery, hand dyed pastel pink lace to create an elegant and striking settings that would enhance any occasion. Feather-like pampas, pastel pink ranunculus, peony roses, eucalyptus are the main flowers we selected with Chiara from Chiara Sperti Floral Events to adorn the bridal bouquet and the wedding floral decorations for the pre-wedding symbolic ceremony, for the table. Intimate moments of the vows exchange took place on the terrace, overlooking the internal garden and an elegant yet rustic table was set for a private lunch on the other side of the terrace to enjoy the immense view over the Tuscan countryside. The delicate pastel pink pre-wedding cake was topped with some lovely ranunculus to continue the flower statement and to create a happy and harmonious balance. Roberta Facchini, Italian fine art wedding photographer, based in London and Italy based videographers, Emotional Movie Wedding Films captured every moment of the day using the most of the available natural light to create these romantic and ethereal images. Surprise 🙂 we have been featured 2 months later on my favorite blog Wedding Chicks! 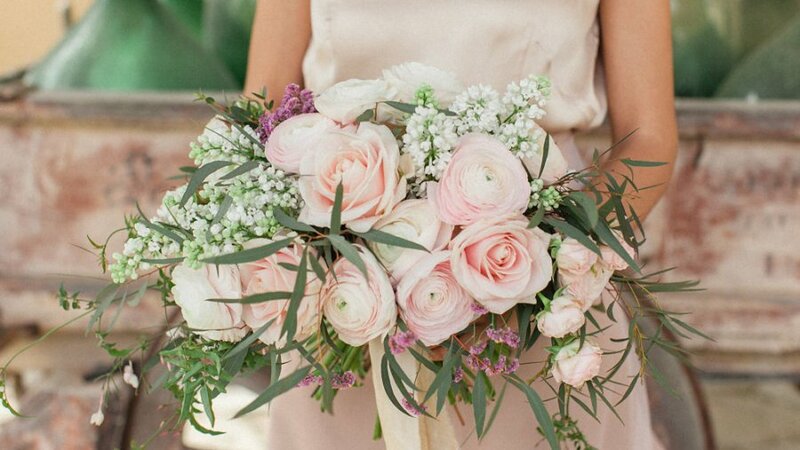 Blush Italian countryside wedding ideas!